Has GPS Suffered Huge Revenue Losses? RUMOR: Gilbert Public Schools and Supporters of the Override Argue the Loss of Override dollars is destroying the local schools and without it there is no way they can give teachers raises or compete. FACT: Not at all The combined property tax rate has remained stable and has even risen a little even though the Voters wisely chose to Sunset the Override in 2012 and 2013. 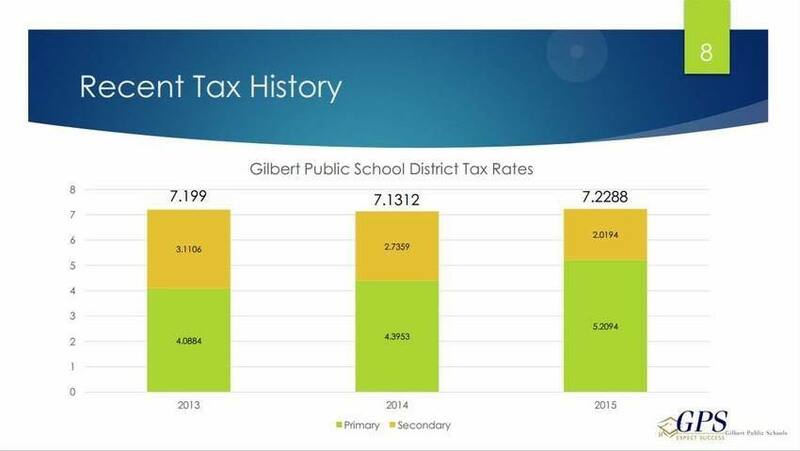 This is because the district ignored the voters decision and back-filled their coffers by jacking up the primary tax rate. At least, it’s clear now, the Override isn’t being used as it was originally intended, as a measure to protect districts from accidental overspending. Nope. The Override is just a game the district plays to try and convince the voters 10% over the budget after the budget reaches the state determined maximum created to protect taxpayers in the first place from excessive school spending.